The image depicts a cross-section of mouse skeletal muscle magnified 60 times. 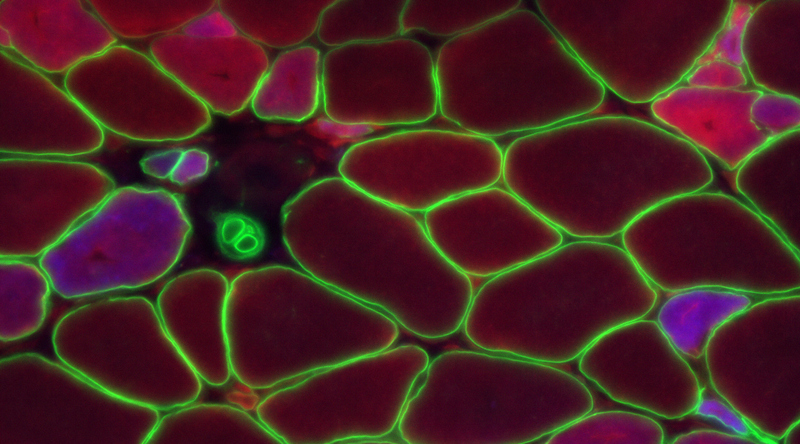 Fibers in the tissue are fluorescently stained for protein synthesis. The green stain outlines individual fibers. The bright pink/purple fibers are newly growing muscle fibers showing protein synthesis rates of these fiber types for the first time. Images like this allow researchers to observe the rates of protein synthesis in different types of muscle fibers.